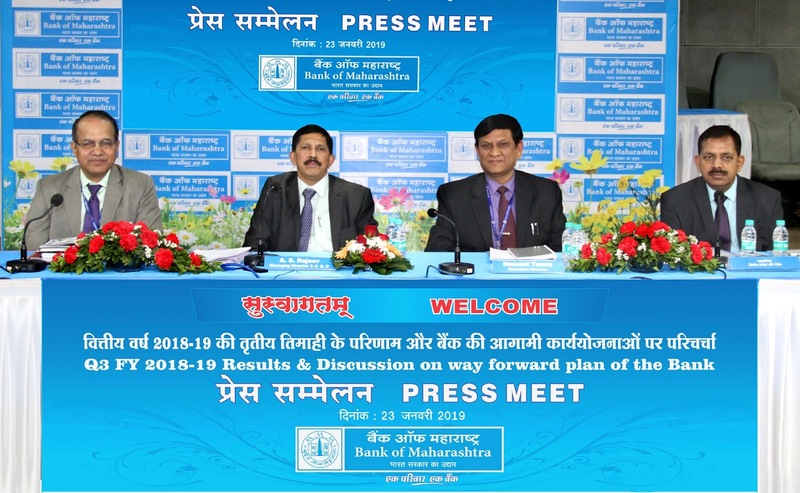 PUNE: A. S. Rajeev, MD & CEO, Bank of Maharashtra announced the financial results for quarter ended Dec 2018, along with A. C. Rout and Hemant Tamta, Executive Directors of the bank. Speaking on the occasion, A. S. Rajeev stated that the bank is making all efforts to improve its financial performance. It has made various structural, systemic and strategic changes this end. The bank will continue to focus on improving operational efficiency and strengthening retail, agriculture and MSME (RAM) to provide value to its customers, shareholder and other stakeholders. Ø Total business stood at Rs. 225596 crore as on December 31, 2018. Ø As on December 31, 2018 total deposits stood at Rs. 136001 crore & Gross advances stood at Rs. 89594 crore. Ø Share of CASA deposits increased to 46.88% as on December 31, 2018 from 44.86% as on December 2017 and 46.25% as on September 30, 2018. Ø Operating profit for the quarter ended December 31, 2018 has increased to Rs. 431.85 Crore in comparison to Rs. 419.36 Crore for the quarter ended December 31, 2017. Ø Operating profit of the Bank for Nine months ended December 31, 2018 has increased to Rs. 1696.51 Crore in comparison to Rs. 1644.67 Crore as on December 31, 2017.
o Provision for wage revision of Rs.82.12 Crore. 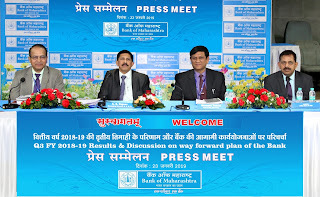 Ø Net Loss for the nine month ended December 31, 2018 stand at Rs.4856 Crore as compared to Net Loss for the nine month ended December 31, 2017 of Rs.1032 Crore. o This increased loss is due to higher loan loss provisions on impaired assets. Ø Non-Interest income for the nine months ended December 31, 2018 increased by 5.24% to Rs. 1162 Crore in comparison to Rs. 1104 Crore as on December 31, 2017. Ø Non-interest income for the quarter ended December 31, 2018 has increased by 52.02% & 1.50% to Rs. 411 Crore in comparison to Rs. 270 Crore &Rs. 405 Crore for the quarter ended December 31, 2017 and September 30, 2018 respectively. Ø Net Interest Income increased by 8.23% to Rs. 2734 Crore for the nine months ended December 31, 2018 in comparison to Rs. 2509 Crore as on December 31, 2017. Ø Net Interest Income for the quarter ended December 31, 2018 has increased by 2.30% to Rs. 872 Crore in comparison to Rs. 853 Crore for the quarter ended December 31, 2017. Net Interest Income for the quarter ended September 30, 2018 stood at Rs. 1003 Crore. Ø Net Interest Margin increased by 21 basis points from 2.29 for the nine months ended on December 31, 2017 to 2.50% in nine months ended on December 31, 2018. Ø Cost of deposit reduced by 40 basis points from 5.41 % for the nine months ended on December 31, 2017 to 5.01% in nine months ended on December 31, 2018. Ø Cost of funds reduced by 47 basis points from 4.99 % for the nine months ended on December 31, 2017 to 4.52% in nine months ended on December 31, 2018. The reduction in cost of funds is due to better Liability management. Ø Robust increase in recovery in written off accounts by 183% i.e. to Rs. 195 crore for nine months ended December 31, 2018 in comparison to Rs.69 crore for the nine months ended on December 31, 2017. Ø Net NPA of the Bank has reduced to 5.91% as on December 31, 2018 from 12.17% as on December 31, 2017 and 10.61% as on September 30, 2018. Ø The Bank has shown consistent efforts in arresting fresh slippages. Slippages reduced to Rs.3612 crores as on December 31, 2018 as compared to Rs.3857 crore as on December 31, 2017. Slippages for the quarter ended December 31, 2018 are Rs.1098 crore as compared to Rs.1536 crore for quarter ended December 31, 2017 and Rs.1365 crore for the quarter ended September 30, 2018. Ø Gross NPAs have reduced to Rs. 15509 crore (GNPA%- 17.31%) as on December 31, 2018 from Rs. 18128 crore (GNPA%- 19.05%) as on December 31, 2017 and Rs. 16873 crore (GNPA%- 18.64%) as on September 30, 2018. Ø Cash recoveries in NPAs during nine months ended December 31, 2018 is Rs.1780 crore as compared to Rs. 1394 crores for the nine months ended December 31, 2017. Ø Provision coverage ratio of the Bank has improved to 81.07% as on December 31, 2018 in comparison to 53.40% as on December 31, 2017 and 64.37% as on September 30, 2018. Ø Provision Coverage Ratio excluding Technical write of stand at 70.17% for nine month ended December 31, 2018. Ø Non performing investments have reduced to Rs.130.40 crore as on December 31, 2018 as compared to Rs.207 crore as on December 31, 2017. Ø RWA reduced to Rs.73304 crore as on December 31, 2018 from Rs.83679 crore as on December 31, 2017 and Rs. 76042 crore as on September 30, 2018. Ø “AAA, AA & A rated” exposure has increased from 53.27% as on March 31, 2018 to 57.62% as on December 31, 2018 amounting to Rs. 21729 crore.